Harmony allows you to control each device directly and independently. We recommend not changing the input/source or power on/off states using this method as it may cause your devices to come out of sync. If you find yourself using device mode often, then we recommend you assign the commands you use most often to your Activity mode. You may enter device only mode on Harmony 600/650/700 by pressing the Devices button in the lower center of the screen as shown in the picture on the left, then select the device you want to control. For touchscreen remotes, press the DEVICES button underneath the touchscreen display, as shown in the picture on the right. 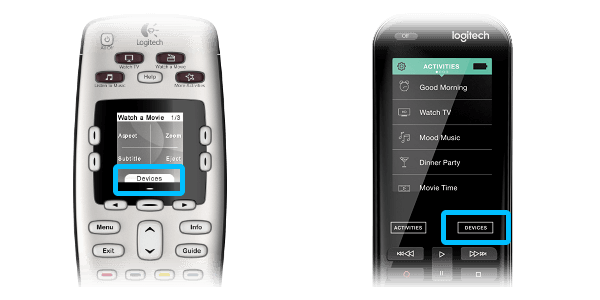 To exit device only mode, press the Activities button on 600/650/700 remotes, or the ACTIVITIES button for touchscreen remotes. On the Harmony app press the Devices tab, as shown in the picture below, to change between screens. Exit device mode by pressing the Activities tab which is located directly to the left of the Devices tab. Launch the Harmony Express app and tap the Device Settings. 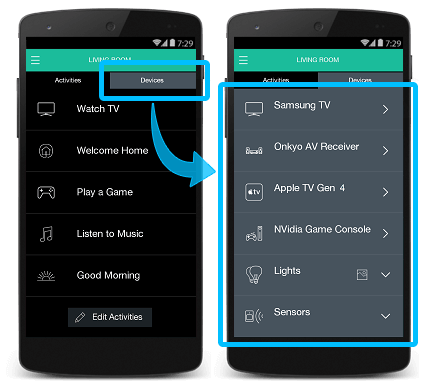 Select the device you'd like to control and select Device Commands. You will be presented with commands that you're able to send.